Jane was born in November 1820 in Stuart Lake, British Columbia, Canada, to Jean Baptiste Boucher and Nancy McDougal. Jane was ¼ Cree and ¼ Sekani; both of her grandfathers were fur traders who married native women. However, depending on the census, Jane was listed as “Indian,” “H-B” (half-blooded/half-breed), or “white.” In the 1870 Frenchtown census, her race was initially indicated as “MB,” then crossed out and replaced with “I,” or “Indian.” The race of her children however, also initially labeled “MB,” was crossed out and marked “W” or “white.” This inconsistency of race and censuses was not unusual with métis families. 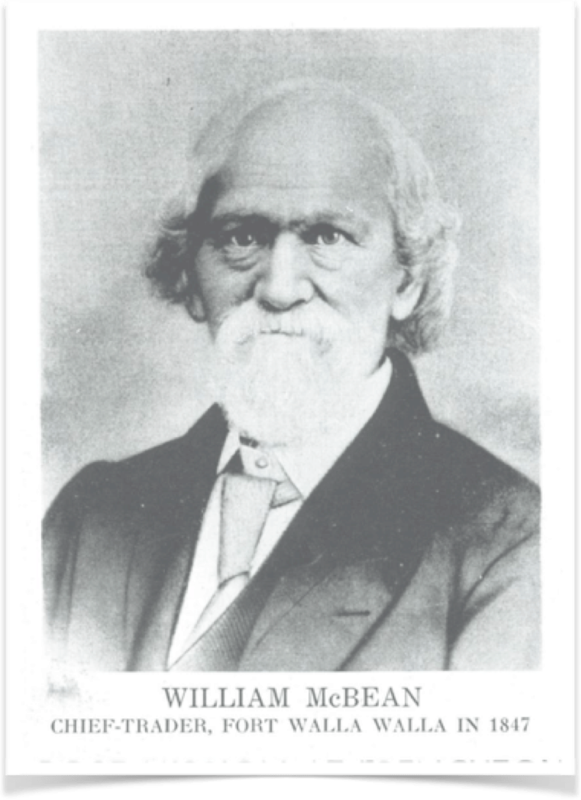 Jane married HBC employee William McBean (1807-1892) in a “country marriage” in 1834. Jane was fourteen years old at the time, and William twenty-seven. It was not uncommon for métis girls to marry as young as twelve. Like Jane, William was also métis, the son of a prominent HBC trader and a Chippewa woman. William had already worked as an interpreter and Post Master when he married Jane on October 11, 1834 in New Caledonia. Nor was Jane his first wife (or perhaps companion)–John Stuart wrote in his report from the McLeod post in 1824 that William had already “discarded” one woman. From 1834 to 1844, William served as Post Master, Apprentice Clerk, and then Clerk at various HBC forts in New Caledonia, and he and Jane had four children, all born in Canada (likely at the different posts where William was working). On June 24, 1844, they were married again in a Catholic ceremony at Fort Vancouver; Jane was baptized into the Catholic church on the same day, along with two daughters. Jane stayed in the Vancouver area until at least 1846, while William served as clerk in charge of Fort Umpqua. In 1846, William became clerk in charge of Fort Walla Walla, a post he held until 1851, when he left the HBC. He and Jane settled in Frenchtown after the 1855 war, officially claiming their land, 650 acres south of the Walla Walla river, under the 1862 Homestead Act. The McBeans donated a site for the St. Rose chapel in 1863, but after only a few months the chapel was moved to the site of the cemetery on the Raymond claim (north of the river and about seven miles west). The McBeans and the Bergevins were linked in the second generation, when Jane’s granddaughters through her daughter Mary and Edward Lefaivre (the spelling of the family name varies widely, appearing as Lefevre/Lefaivre/LaFavre/LaFave), married the three sons of Celina Forest and Louis Bergevin. This was not a romantic triple wedding but a series of unions–Carrie married Louis Bergevin in 1888, Agnes married Joseph Bergevin in 1895, and Josephine married Thomas Bergevin in 1897. Many McBean children, grandchildren, and great-grandchildren received allotments on the Umatilla Reservation. 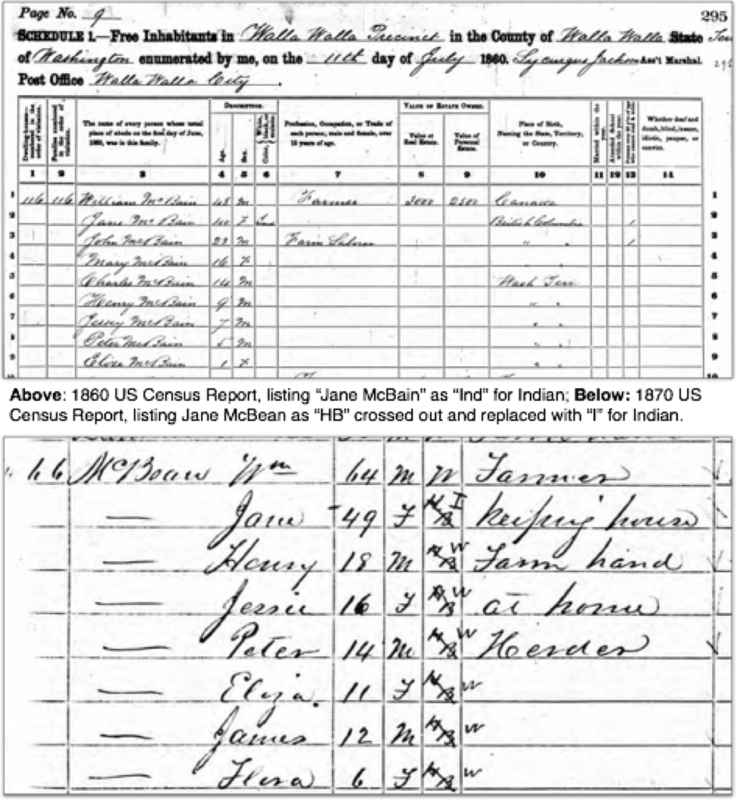 The 1900 census indicates Jane was widowed and owned and lived on the McBean farm with her youngest daughter Flora, then 36, and an orphan granddaughter named Amelia, 14. Her husband William had died in April, 1892. Jane died on June 10, 1905, and was buried in Mountain View Cemetery. Early Oregonians Index, 1800-1860, entry for Boucher, Jane, accessed May 30, 2017, https://secure.sos.state.or.us/prs/profile.do?ancRecordNumber=111730; See also the entry for “Boucher, Baptiste “called Wakan”” in the index of Munnick’s church records for Ft. Vancouver p. A 9, which says Jane’s father Jean Baptiste was “half-Cree.” Her maternal grandfather was James McDougall, a NWC trader who married a Sekanie woman. 1860 says “Indian,” (Year: 1860; Census Place: Walla Walla, Walla Walla, Washington; Roll: M653_1398; Page: 295; Image: 308; Family History Library Film: 805398); 1870 has “H-B” crossed out and replaced with “Indian,” (Year: 1870; Census Place: Frenchtown, Walla Walla, Washington Territory; Roll: M593_1683; Page: 256A; Image: 102852; Family History Library Film: 553182), and 1880 has “white” (Year: 1880; Census Place: Walla Walla, Washington; Roll: 1398; Family History Film: 1255398; Page: 241C; Enumeration District: 050). Sylvia Van Kirk, Many Tender Ties: Women in Fur-Trade Society, 1670-1870, (Norman: University of Oklahoma Press, 1983),109. William McBean’s HBC employee record, accessed May 30, 2017, http://www.gov.mb.ca/chc/archives/hbca/biographical/mc/mcbean_william1828-1851.pdf. Early Oregonians Index, 1800-1860, entry for McBean, William, accessed May 30, 2017, https://secure.sos.state.or.us/prs/profile.do?recordNumber=106536. John Stuart, HBCA McLeod Lake Post Journals B.119/a/1, February 6, 1824, p. 60, quoted in Bruce McIntyre Watson, Lives Lived West of the Divide: A Biographical Dictionary of Fur Traders Working West of the Rockies, 1793-1858 (Kelowna: University of British Columbia, 2010), 77. McBean’s HBC record; also Harriet Duncan Munnick, Catholic Church Records of the Pacific Northwest: Vancouver Volumes I and II and Stellamaris Mission; Vancouver II, P. 40, B 201 Marie McBean, B 202 Jane Boucher, B 203 Sophie Boucher, M 22 Wm. McBean and Jane Boucher. Birth record of Charles McBean; also McBean’s HBC record. U.S. Department of the Interior, Bureau of Land Management, “General Land Office Records,” Patent, glorecords.blm.gov, (https://glorecords.blm.gov/details/patent/default.aspx?accession=WAWWAA%20024580&docClass=SER&sid=e2qik1po.vtp: accessed May 31, 2017), WAWWAA 024580; entry for McBean, Jane and McBean, William, Meridian- Willamette, 006N – 035E, Sections 3, 4, 9, and 10, Survey 39, Walla Walla, issued May 1, 1878. In 1892 Amelia is living on the reservation and is listed as mixed blood, daughter of John McBean, widower. In the 1900 census she is listed as white. John McBean, Jane’s son, died in 1896. Early Oregonians Index, entry for McBean, William. Early Oregonians Index, entry for Boucher, Jane.